This Apple Mac Pro Quad is powered by two Dual Core 2.66 GHz 65-nm 5150 Intel Xeon Clovertown processors with 4 MB L2 cache per processor and a dual frontside bus speed of 1333MHz. 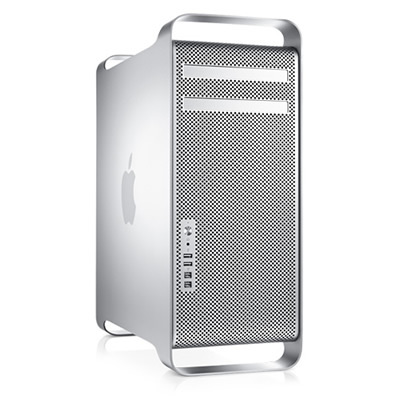 The Mac Pro, although similar to the Power Mac, is completely redesigned. It includes the introduction of Intel Xeon processors and 64-bit data architecture, dual SATA optical drive bays, four independent 3Gb/s SATA hard drive bays with carriers and Firewire 800 ports among other changes. It includes 4 GB of 667 DDR2 MHz PC2-5300 ECC memory, two 160 GB 7200 RPM SATA hard drives, a Dual-layer DVD SuperDrive and an ATI Radeon HD 2600XT video card with 256MB DDR3 memory that is capable of running two Apple 30 inch displays at resolutions of 2560x1600. Expansion includes one free optical drive bay, three free hard drive slots, and three free full length free PCIe v1.1 slots with support for 16 lane cards. Connections include five USB 2.0 ports, two Firewire 800 ports, two Firewire 400 ports TOSLINK optical digital audio input and output, analog minijacks for stereo line-level input and output, a front-panel headphone minijack, and two dual-link DVI ports. Communications include two independent 10/100/1000 Gigabit Ethernet ports. AirPort Extreme 802.11n Wi-Fi that is 802.11a/b/g compatible is optional. Bluetooth 2.0 + Enhanced Data Rate wireless is optional. The original Mac Pro was released on August 7th 2006 and discontinued on January 8th 2008. It initially came with OS X 10.4 Tiger installed. Dimensions: Height 20.1, Width 8.1, Depth 18.7 inches. Weight: 42.4lbs. This used Mac Pro Intel Xeon Quad 2.66GHz is in great condition with some minor marks on the case from previous use. It comes with OS X 10.5 Leopard installed and copies of original Apple OS X install discs that include a bundled software package, (10.5 discs included, 10.4.8 discs are available if requested) and power-cord. A keyboard and mouse are optional.